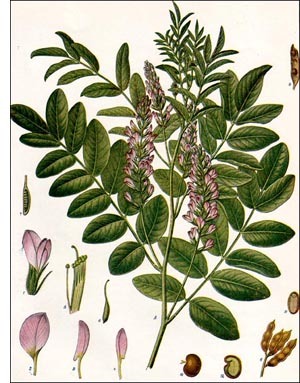 The licorice-yielding plant is a perennial herb with a thick rootstock, having a number of long, sparingly branched roots and very long runners or rhizomes. It belongs to the same family as the peas and beans. It has purplish flowers with the irregular corolla characteristic of the family. The pods are rather small, much compressed, each with from two to five seeds. The plant is in all probability a native of the warm parts of the Mediterranean region. There are several varieties, all of which are more or less extensively cultivated and placed upon the market. Licorice is extensively cultivated in Greece, Italy, France, Russia, Germany, the Danubian Provinces, southern China, northern Africa, and to some extent in England. In the Italian province of Calabria, licorice is planted with peas and corn. In the course of three years the roots are collected, the juice expressed, and the root evaporated to the proper consistency for shipping. New crops are grown from cuttings of the rhizomes. There is an excellent quality of licorice grown in the vicinity of Smyrna. The principal commercial varieties are grown in Spain, southern Russia, Turkey, and Italy. Spanish and Russian licorice root is dried and shipped in bales or bundles. Spanish licorice root is unpeeled and occurs in pieces several feet in length. Russian licorice is usually peeled. Most of the licorice used in the United States is obtained from Italy, Russia, and Germany. Some of the licorice found upon the market is quite fragmentary and very dirty. The licorice raised in England is intended for home consumption and is placed upon the market in both the fresh and dried state. The fresh roots have an earthy and somewhat nauseous odor.